How do we learn history? Textbooks give us dates and leaders; students memorize facts for the test, but few people have a deep understanding of how our ancestors lived. As a child I felt that lessons of wars and nations had little bearing on my family history. It was like studying weather patterns, gusting far above, knowing that my peasant grandparents had survived in thatched huts in Poland. What was their story? My art is created with that question in mind. The objects I use are collected at my equivalent of archaeological digs: garage and estate sales. In my Passaic neighborhood, there are still large numbers of first and second generation immigrants from Eastern Europe. At these sales I hear the language and find the tools of my grandparents. There, I unearth items that were once commonly used in the domestic sphere – pincushions, darning eggs, crochet hooks – but are now almost extinct. I exhume forgotten embroidery and mending, and present them as petrified specimens. 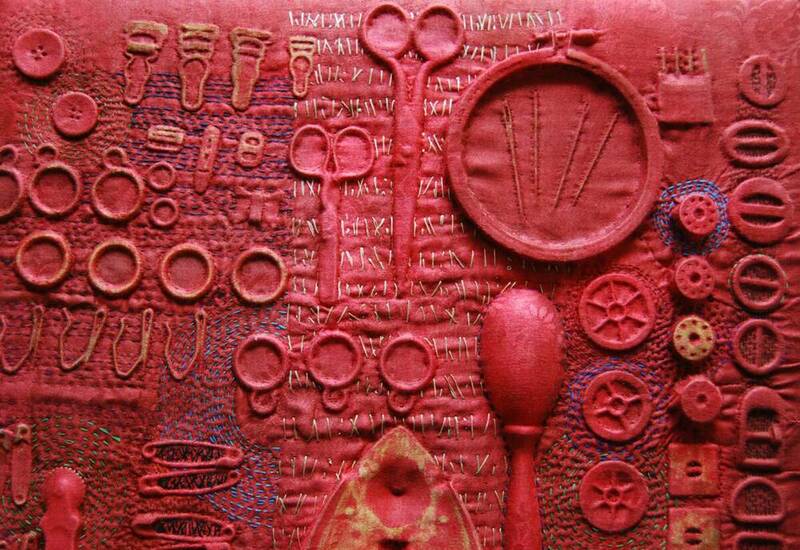 My textile works are art and archaeology. They are the stories of past generations. By deconstructing past artifacts and preserving them in an archaeological presentation, I hope to change viewer perception of our textile heritage.